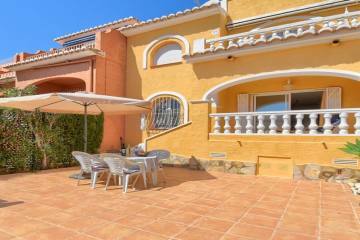 South facing Villa located in Moraira, with Sea Views, for sale with a separate apartment on the ground floor comprising of a living room, kitchen, bedroom and a bathroom. On the upper level, you have the main house with double glazing and modern windows and consisting of a covered terrace (Naya) with stunning views across to Moraira and the sea. Open plan living with a dining and a kitchen area, two bedrooms that share a bathroom. The property has an underbuild and storage that could be developed in a summer kitchen or extra accommodation. Also included is a sauna in the storeroom and a Jacuzzi in the garden. The garden area has some mature Palm trees and a kidney-shaped pool with traditional tiling. In need of some renovation and OPEN TO OFFERS!